How is Asia faring in the Global Philanthropy Report? The Global Philanthropy Report released by Harvard Kennedy School’s Hauser Institute for Civil Society, and funded by UBS and Ford Foundation, aims to understand the magnitude, vitality and impact of global institutional philanthropy. The study identified 260,000 foundations in 38 countries (+ Hong Kong) and deals with various elements of philanthropy such as the global scale of foundations, its age, classification, financial resources, their priorities and operational approaches. One of the findings that stood out in the report is the age of the sector, where three-quarters of the foundations studied being younger than 25 years old. Viewing this fact from the Asian perspective, the Centre for Asian Philanthropy and Society in the Doing Good Index, 2018 has stated that the median age of Social Delivery Organisations in Asia is 14 years. The relative youth of the sector can be attributed to the increase in its individual wealth due to the regions tremendous economic growth which has led to more individuals venturing into philanthropy. For example, the number of Chinese billionaires grew from three in 2004 to 568 in 2016, a 200 times increase within 12 years. By 2015, eight percent of the world’s super-high-net-worth individuals with more than USD 50 million in assets were in China 2. Apart from the increase in individual wealth, many philanthropists grew up at a time when the region was largely poor, this along with the personal desire to enact positive change in the society coupled with humble upbringings have been regarded as the main drivers of philanthropy in Asia. Considering this trend continues, the social and economic impact due to philanthropy is going to be more significant. Hurun Global Rich List 2016, Huron Institute, 2016 mentioned in The Chinese Collectivist Model of Charity. Stanford Social Innovation Review. 2017. 2 Global Wealth Report 2015, Credit Suisse, 2015 mentioned in The Chinese Collectivist Model of Charity Stanford Social Innovation Review. Collaboration among foundations has been emphasised to foster the increase of capital in the region, and also to encourage a platform to exchange views and insights among philanthropists and foundations to scale impact. The global philanthropy report highlighted that 58 per cent of the foundations identified for the study do not collaborate with one another even though they might be working towards the same objectives. This trend exists despite various conversations within the philanthropy sector on the need for an efficient convergent mechanism that sustains through time. The report findings showed that an annual investment of USD 5-7 trillion is required to satisfy the UN Sustainable Development Goals, and collaborative approach is one of the suitable methods to achieve this objective. In a study conducted by Asia Centre for Social Entrepreneurship and Philanthropy, the findings of the report concluded that collaboration was limited among foundations in Asia. The Myanmar-based institutions interviewed for the study worked independently, although there were some collaborations between foundations in China and Singapore. Despite this, the report concluded stating there is scope for positive trend towards collaboration among non-profit organisations, foundations and international non-governmental organisations in the region. Although collaboration among Asian countries has not reached the desired level, collective impact among Chinese philanthropists is making news. For example, Jack Ma, the founder of Alibaba, focuses on environment sustainability as part of his philanthropic activity, but unlike many western organisations, he did not establish a foundation in his name but rather founded a joint project called Paradise International Foundation along with like-minded people. 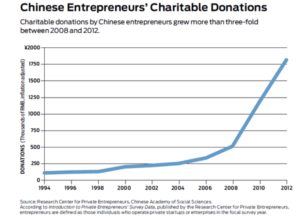 This example can be validated by other philanthropists in China, where the ratio of individual donations is on a decline and on the contrast collective donations have witnessed a rise. Asia has been under represented in the report, primarily due to the nascent sector and lack of data forthcoming in this part of the world. However, with the rapid growth of the economy and increase in individual wealth, philanthropy in the region is set to grow and setting our benchmark and reference against a global standard will be helpful in the sector’s continued development.